10 Alone : To grow up.. be a Kid again.. Ten Alone.. a saga of 10 friends Ten Alone : a saga of 10 friends.. 10 Chartered Accountants..
"To grow up.. be a kid again." 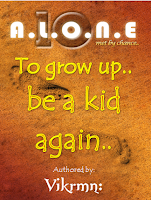 Excerpts from Novel 10 Alone : Growth needs a change; A point where we have to start from. Time demands an inception where all the worries are to be forgotten.. concerns of past and future to be dropped.. life to be started afresh.. just living in present.. like a Kid. So to grow up..